When it comes to comfort and hygiene in the bathroom, nothing compares to bidet toilet combos. These innovative devices offer far much better cleaning capabilities than a regular toilet and a standard toilet paper. They are definitely the best choice for a relaxing, comfortable and hygienic toilet experience. However, like many other smart devices, there are all kinds of bidet toilets out there with different styles, design and build quality. To avoid making a costly mistake, you need to be extra careful when selecting a combined bidet toilet. You should pick a unit that’s convenient, versatile and effortless to use (Source). A unit that you can rely on to give you that extra comfort and cleansing every time you visit the toilet. In this review, we are going to look at the top five bidet toilet combos on the market. We will examine models that represent quality in term of both design and functionality. 16 Q: Can you pee in a bidet toilet? 17 Q: Bidet combos are expensive. How will I know if I want one? 18 Q: Where do bidets come from? 19 Q: Why aren’t bidets commonly used in America? The highlight of this TOTO’s smart toilet is its functionality. Everything feature is fully automated. You just need to relax and the unit does the rest of the work. The unit efficiently gets rid of all waste with a dual flushing system is very effective. All waste is disposed of with minimal water usage. The three nozzles are powerful and create a centrifugal cleansing action that increases the flushing capability of the toilet. As soon as the lid opens, an automatic pre-mist sprayer wets the bowl surface to ensure that no waste sticks to the bowl. Once you are done, a self-cleaning wand kickstarts the cleansing process. The wand has three cleansing functions, the rear wash which is strong and very effective, the soft rear spray which has a lower pressure but covers more space and finally the frontal cleanse which is meant for ladies. It produces large, soft drops for thorough cleansing. The toilet offers five different seat –warming temperature settings. This is a big plus because it means you can even set the seat temperature according to your preference which can come in handy during the winters. The unit is manufactured using vitreous china and has an ultra-smooth finish to help prevent the development of stains and the growth of bacteria. 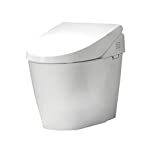 The TOTO smart toilet also sports a dull traditional commode look. The skirted design combined with the cotton white finish gives it a simple yet elegant ultra-modern look that is visually appealing. 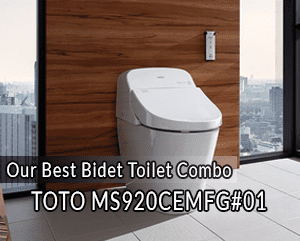 Generally, MS920CEMFG#01 is one of TOTO’s best smart toilet. It may look basic but it’s a sophisticated unit with regards to functionality. For those looking for a toilet bidet combo that combines exquisite adjustability and hygiene, it is the perfect product. Offers a comfortable seat position for a wide range of people. 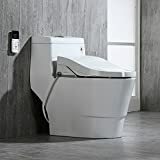 WoodBridge is a reputable company when it comes to sanitation products and their T-0008 combined bidet toilet is designed to offer enhanced comfort and cleansing. The first thing to like about this WoodBridge model is its sleek modern design. It has an elegant yet contemporary styling that will easily suit any modern bathroom outlook. The elongated bowl is about 2750mm high which is a comfortable height for most people. However, the main selling point for this unit is its efficient flushing system. It’s able to completely eliminate any bulk of waste in every flush. It flushes clean without using much water. It’s not automatic like that of the TOTO MS920CEMFG#01 above, but it’s a dual flushing system. You can choose between light and heavy flushes with a press of a button. If it’s a bulk of waste, then there is a heavy flush button to get the job done and if it is small waste and urine, then you just press the light flush button the wastes are totally removed. All this is made possible by its siphon flushing action which not only leaves your toilet clean but also saves you more water. The self-cleaning nozzle, on the other hand, is very convenient. It’s made of stainless steel uses filtered water for different hygiene wash. The nozzle offers an adjustable water pressure allowing you to set your own preference depending on the area that you want to clean. You can adjust it for posterior was, pulsating wash or the feminine wash. Once you are done cleaning, there’s a warm air dryer to dry you up. Cleaning the bowl’s exterior surface is easy. The skirted bottom design of the unit provides quick access to all sides. It’s nicely contoured. It does not have grooves and corners that might complicate cleaning or create hard to reach areas like most traditional toilets. The only notable problem with this WoodBridge T-0008 is that there seems to be a small flaw in the button design. They are somewhat flimsy and can get stuck on a function. Despite this drawback, the WoodBridge T-0008 remains a reliable bidet toilet. TOTO’s Neorest line of smart toilets is arguably the best in the industry and this model does well to uphold that reputation. There is no any other option on this list that’s far more hygienic than this model. First, it features the ewater+ function which is one of TOTO’s most outstanding innovations. The unit converts ordinary tap water into an electrolyzed water which has the same properties as a household bleach. So, it’s more effective at sanitizing the toilet than the other units which use pure water. It also has CeFIONtect on its ceramic bowl. CeFIONtect is a non-porous glaze. It’s very smooth thereby makes it hard for waste, bacteria, and mold to stick on the bowl surface. On top of this, there is a pre-mist and after-mist function. The ewater+ is first sprayed onto the surface of the bowl to sanitize it and also prevent waste from sticking on it. Once the flushing is done, the After-mist function sanitizes the toilet again. So, the bowl remains clean and sanitized at all times. Like the G400 above, the Neorest 550H has tornado dual flushing system. It releases strong jets of water spirals that will sweep everything in its path all the way down to the bowl outlet. This smart toilet offers three modes of wash which include front, rear and soft washing. The wand position is adjustable, so you can adjust it to get the best spray-hit without having to move your rear. This is particularly very useful for those that may not be able to move their lower body while seated due some physical condition or disability. The best part is that you can also adjust the water pressure and temperature to your liking. The only setback with this TOTO’s unit and actually with almost all of TOTO’s units is that they are sophisticated, so installing this will require a professional plumber. Other than that the Neorest 550H is a reliable Bidet Toilet Combo designed purposely to offer optimal hygiene and comfort in the bathroom. Its price point is higher than the other models on this list but it’s worth every single penny. The Bio Bidet IB835 is a great option for those who don’t want anything fancy but just a good modern integrated bidet toilet that will get the job done well without spending a lot. Its features list is not pretty packed like that of the other three units above but it’s more than an ordinary combined bidet toilet. When it comes to aesthetics, the unit has a low-profile, seamless skirted design with contemporary finishes that give it a strikingly clean, modern look. The reservoir is incorporated into the back of the unit instead of a tank that sticks up from the rear. It looks tankless and with the low profile style, it can nicely integrate within any sized bathroom. As for functionality, there is nothing fancy but the job gets done. The flushing system is automatic and it’s strong, so everything gets swept out to the septic tank. The best part and one that sets this unit apart from ordinary toilets is that it offers a complete bidet cleansing experience. It has a dual cleansing wand with continuous warm water for posterior and feminine wash. The wand isn’t rigid and there’s a warm air dryer that’s surprisingly powerful and actually dries your rear in a good amount of time. So, you get to go through the whole cleansing process plus the drying cycle like in any other top model. Plus the unit provides a fully functional control through a wireless remote where you can control all functions including the flush although it’s automatic. It has a touchscreen display and allows you to even adjust the temperature of the seat which is essential especially during winter. The unit also has kids feature which we are yet to test. Generally, when you look at this Bio Bidet model, it has everything that you could possibly need from a bidet combo system. If you value convenience and don’t mind a simple but elegant conventional look, then the Bio Bidet IB835 is a good option to consider. Closing the list is the ProStock PSBTWE1000 bidet toilet system. A simple, well-designed unit that’s more than capable of delivering optimal comfort and cleansing at minimal cost. If you are on a budget but still want a good combined bidet toilet, then this is a good option. You won’t struggle when it comes to operating the unit. It has a very easy to use remote control whereby you can control almost any function. You can adjust the seat and water temperature using the controls on the remote. The unit features a dual-flush system but like the Bio Bidet, it does not have a pre-mist function to wet and sanitize the surface of the bowl. Nonetheless, the flush is strong and effectively sweeps out all the waste with either the 1.6 or 1-gallon flow rates. The cleansing wand is set to clean and sanitize itself whenever you use it and you can adjust its position as well as flow rate. It offers front and rear cleansing and the water is warm. You can adjust the temperature of the water if you want to and there are custom spray modes. So, as far as personal hygiene and convenience is concerned, this unit has that covered pretty well. The lid opens as soon as the sensing window detects your presence and later closes automatically after use. So, considering that the flush is also automatic, you do not need the remote. The toilet has a very modern look with a low-profile, skirted design that nicely hides the trap-way. It’s only a few lines that collect grime and dirt thereby cleaning and maintaining the unit won’t be much trouble. With a total height of 575mm, the unit will accommodate everyone at home. The only major setback is that like the Bio Bidet IB835, this model does not have a pre-mist function. So, it solely relies on the flushing power to eliminate the waste of which it does well. To sum it all, the ProStock PSBTWE1000 is a decent bidet toilet combo that’s more than capable of offering the same comfort and hygienic cleansing you would find in a high-end model. The best part of all, it’s quite affordable. The bidet toilet combo is a stand-alone toilet but much different from other ordinary toilets because it also incorporates a bidet. So, unlike buying an ordinary model, you will need to be extra careful when selecting a bidet toilet combo so yu don’t waste money on a flimsy unit. Here are the main things you should keep an eye on. The first thing you want to consider is the material used to make the toilet. This includes both the bowl and the seat. Most quality models feature either ceramic or porcelain construction. Both materials are very durable. There are other models where the bowl is glazed to prevent waste from sticking to the surface and a good example is TOTO’s units which the CeFiONtect ceramic glazing. These are the best option because they require little cleaning. Here you have two options to consider, one-piece or two-piece construction. In one-piece toilets, the tank and bowl are integrated together forming one complete seamless unit. They have a low-profile with nor crevices to harbor stains or allow germs to grow, so cleaning is easier. Two-piece toilets, on the other hand, have the bowl and tank as separate units, so they are some hard-t-reach areas which can make cleaning tedious. Bowls come in two shapes which include a round or elongated bowl. Round bowls are more circular and small in size, so they will conserve bathroom space. However, elongated bowls are more oval and have more capacity thereby they will take more space but have less chance of overflowing or clogging. Generally, the type of bowl will depend on your preference as well as the space you have in your bathroom. However, you want to also check the height of the ball to ensure that’s it comfortable for everyone both young and old. The standard height of most models will range from 17 to 19 inches from floor to the bowl rim. An ideal height should be at least two inches higher than the standard. You also want to ensure that the toilet seat is the right shape. Like the bowls, the bidet toilet seats can be elongated or round shaped. Elongated seats are usually large in size and are the most common option for bidet toilet combos. Round seats are more popular in ordinary toilets but there are some bidet toilet combos that have them. They are usually shorter in size which makes them the perfect fit for children but might be uncomfortable for larger users. So, here you might go with an elongated seat design. 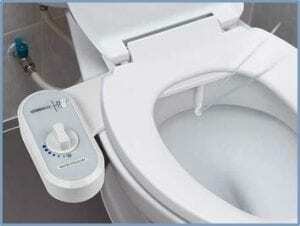 You can operate a bidet through either a control panel attached to one side of the seat or a wireless remote control. In this case, the nest option is wireless remote control because it’s easier to use than a control panel which you have to twist or look behind in order to access some of the controls. The flushing is one of the most vital factors to consider when it comes to selecting a bidet toilet because it’s all about getting rid of the waste. Here you want a system that can produce powerful and effective flushes without using a lot of water. In this case, the ideal option is a dual flush system. It’s able to deliver effective flushes based on the type of waste. The system allows you to choose either partial flush for liquid waste or a full flush for solid waste. So, it not only weeps out all waste per flush but also saves a considerable amount of water compared to standard flush systems. It’s also more convenient and hygienic for you if you can consider units where the flush system is automatic so that you get to enjoy a hands-free operation. The main benefit of a bidet toilet combo is its cleansing capability and the extra comfort that it provides while doing your business. The key component to prioritize regarding comfort is the seat. In this case, you want a bidet that offers a pre-heated seat because it will keep you warm and cozy even during cold winters. Some models have strong water pressure which might not be comfortable for all users. So, adjustable water pressure will allow you to set the spray according to your preference rather than sticking to one setting. Not all bidet toilets have heated air dry function but it’s a feature that’s worth considering if you want the best bidet toilet combo. Therefore, you should look for a unit that features a warm air dryer because it will not only help dry the wet area after cleaning but will also prevent chafing and save you from investing on toilet papers. They are also some additional features that are not essential but are common in most bidet toilet combos. Most of these features simply add to the aesthetics of the product. Generally, these are main factors that you should first keep an eye on when evaluating different bidet toilet combos. Q: Can you pee in a bidet toilet? A: The short answer? Absolutely not. The long answer? Bidet toilets are designed to clean the private parts. This means there is zero need for toilet paper, which is a money saver, better for sewer systems, and environmentally friendly. Additionally, a bidet does not actually flush. The water trickles out of the bidet. This means that if you accidentally use the bidet, it will take many uses to completely clean the bidet. Be careful not to use the bidet instead of a toilet. Q: Bidet combos are expensive. How will I know if I want one? A: There are several options to choose from. 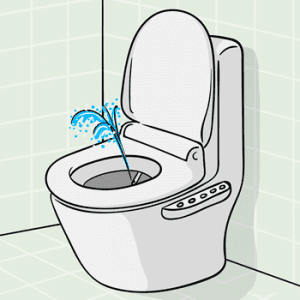 For example, you can purchase a bidet attachment, which simply attaches under the lid of your current toilet. You can also purchase a new toilet lid which functions as a bidet. Both of these options are frugal, allowing you to try out a bidet without dipping into your savings. Firstly, a bidet toilet combo prevents the need for toilet paper. This saves you money in the long run, protects your sewer system, and is more environmentally friendly. Second, a bidet can provide comfort for those struggling with various illnesses. For instance, people with hemorrhoids or Crohn’s disease often have a hard time with wiping. A bidet provides ease of use and relief. Finally, a bidet simply provides a better cleanse for your body. While toilet paper may not always get everything left behind, the spray from a bidet certainly will. Q: Where do bidets come from? A: Bidets are believed to have originated in Europe, or, more specifically, in France. These bidets were originally used as a fixture which was stood over, and then the user was sprayed. This was because the majority of citizens at the time had chamberpots in their bedrooms and needed a way to clean themselves after using the pot. Over time, these bidets have moved into bathrooms and have progressed to offer easier ways to clean yourself. For instance, some bidets have a spray attachment which allows you to use your hand to operate the spray. Q: Why aren’t bidets commonly used in America? A: In America, bidets are not commonly used. Why is this? Because the British, or English, were incredibly opposed to anything designed by the French. This means that when the British originally came to America, the British were not using the bidet. Thus, it never caught on in the States. If you live in the United States, it would be wise to purchase a bidet toilet combo. Remember, this combo allows your toilet to function both as a bidet and as a standard toilet. This will allow you to use your bidet without confusing any American guests you may have. A combined bidet toilet unit offers advanced hygienic cleansing and customized toilet experience, unlike ordinary toilets. However, like any other investment, it is important to ensure that you end up with only the best in terms of quality and function. The five options listed above are well designed and offer reliable cleansing. 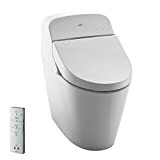 They are the best in the market, and with the guide we have provided above, you should have zero issues purchasing a solid bidet toilet unit that fulfills your requirements. What do you look for when buying a combined bidet toilet? Share with us below!